CakeSpy Note: OMG! The 46th Annual Pillsbury Bake-Off is coming! Since I so deeply loved attending the 45th Bake-Off, I thought I would get you excited early by sharing some of the finalists' recipes. Do I need to tell you that the winner will receive one million dollars? My posting is on hyperdrive since the event is less than a week a day--check back often, because I will be posting recipes like crazy until the big event! Of course Sue Odren of Sand Lake, Michigan is excited about cherries. She's in the land of delicious cherries, Michigan! 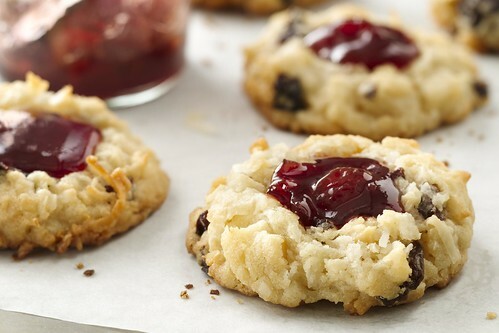 These sugar cookie macaroons are made wonderful with the addition of tart cherries. Heat oven to 350°F. Line large cookie sheets with parchment paper. Let cookie dough stand at room temperature for 10 minutes to soften. In medium bowl, break up cookie dough. Add nuts, cherries, coconut and vanilla. Mix with wooden spoon or knead with hands until well blended. Shape rounded tablespoonfuls of dough into balls. Place 2 inches apart on cookie sheets. Bake 15 to 20 minutes or until edges are light golden brown. Cool 3 minutes. With back of teaspoon, make indentation in center of each cookie. Spoon 1 teaspoon preserves in each indentation. Cool completely, about 20 minutes. Store in covered container.